DIRECTIONS: Bring a medium saucepan of salted water to a boil. Add the soba and cook until al dente, about 3 minutes; drain. Rinse the soba under cold water and drain, shaking off any excess water. In a small skillet, toast the sesame seeds over moderate heat, stirring, until they begin to pop, about 2 minutes. Transfer to a plate to cool. In a small bowl, combine the chicken stock, soy sauce, sugar and sesame oil. In a large skillet, heat 1 tablespoon of the vegetable oil. Add the bok choy, ginger, garlic and scallions and stir-fry over high heat until the bok choy is crisp-tender, about 5 minutes. Add the soba noodles and cook, tossing, for 2 minutes. Add the soy mixture and bring to a boil, tossing. Remove from the heat and keep warm. Meanwhile, in a large nonstick skillet, heat the remaining 2 tablespoons of vegetable oil. Season the fish with salt and dust with the rice flour. Add the fish to the skillet, skin side down, and cook over high heat until crisp, about 4 minutes. Flip the fillets and cook until just opaque throughout, about 2 minutes longer. Sourced fruit from the cool Russian River Valley, this beautiful wine’s perfumed aromatics indicate immediately that it is pure 100% California Sauvignon Blanc. Grapes from the Chalk Ridge Vineyards were used in making this inaugural Russian River Valley Sauvignon Blanc. The ideal growing season was typical of the appellation: cool, foggy mornings followed by warm, sunny afternoons. The fruit was picked at optimum maturity with a just a hint of botrytis. Fermentation was slow and cold (50°F) to retain the varietal flavors. A bouquet of honeysuckle, gardenia and citrus blossom fills the glass. Crisp and mouth-watering, this pretty wine will pair with oysters on the half shell, spicy Thai spring rolls or a salad of endive, goat cheese and crisp green apples. 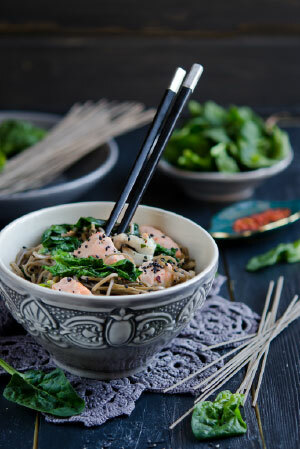 This entry was posted in Recipes and tagged california wine, food pairing, recipe, russian river, russian river valley wine, Sauvignon Blanc, sea bass recipe, silky wine, soba noodles recipe, wine, wine club, wine pairing, wine tasting, winestyles. Bookmark the permalink.